MICROMOT steel collet chucks. With greater constant spring forces. NOTE: The collet makes a big difference! MICROMOT steel collets are hardened and have a high, consistent flexibility so that they maintain their accuracy, even if used regularly. 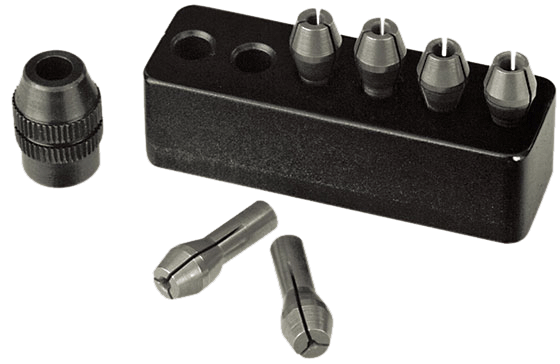 The triple slit collet offers a substantially better load bearing surface than the easier to produce four-slit type. This is especially important for cutters with small shank diameters. Fits all MICROMOT machines, except the engraver GG 12. 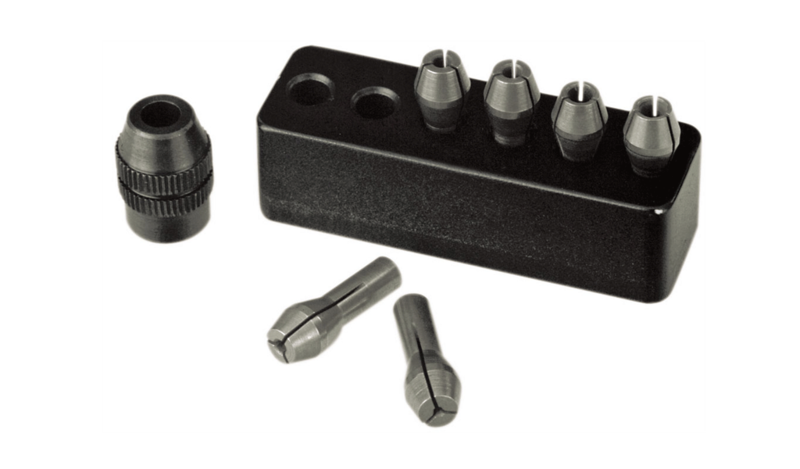 One each in size 1/32", 1/16", 5/64", 3/32", 7/64" and 1/8" (1.0, 1.5, 2.0, 2.4, 3.0 and 3.2 mm) come as a set in a practical holder for storage along with one clamping nut. Our drill chuck (NO 28 941) provides more convenience to quickly change the tools when working with shafts of varying diameters (e.g. HSS drills as per DIN 338). However, because of their technical setup, they have a few drawbacks compared to collets: Less clamping force and higher concentricity tolerances. If high precision is necessary, then working with MICROMOT steel collets is a must.